If there was one person in all of Hollywood who knew about over-the-top movie making it was Cecil b. De Mille. 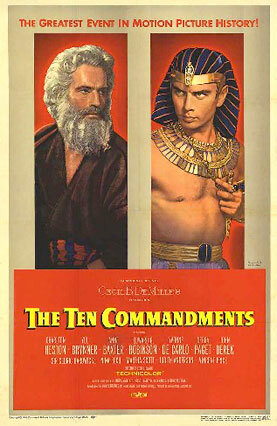 Indeed, his name became synonymous with epic following his 1923 silent black-and-white film The Ten Commandments and his very vocal, technicolour remake in 1956. The latter, his directorial finale, even features the aging director as narrator, introducing his story in front of a lavish theatre curtain. “Are men the property of the state or free souls?” he asks before warning the viewer that the film takes 3 hours and 39 minutes to unfold. The curtain then rises on an overblown extravaganza beginning on the banks of the Nile and travelling with the outcast baby Moses to his new home in the palace of the Egyptian Pharaoh. Surrounded by excessive pomp and pageantry, Moses soon grows into the mighty frame of Charlton Heston. In the original trailer, De Mille excitedly points out the resemblance between his young star and a sculpture of his character by Michelangelo. And it’s true that by the time he comes face to face with God on top of Mt. Sinai the actor has acquired a certain chiselled nobility. Watching him now, striding down with the eponymous tablets (carved in ancient Hebrew from authentic Sinai stone), one can well imagine how this part might’ve gone to Heston’s head, prompting him to pass down even more commandments or at least to proclaim to his fellow Americans their constitutional right to bear as many arms as they felt inclined. In its day, this film wowed audiences with its special effects, foremost among which is the parting of the Red Sea, a scene that took five years to prepare and which helped win John P. Fulton an Oscar (the only prize out of seven nominations – none of them, not surprisingly, for acting). Yul Brynner is strident and two dimensional as Ramses 1 and Anne Baxter is a right little melodramatic vixen as his wife Nefritiri. Never, for one minute, do you forget that you are watching American actors on a huge, studio back lot but for spectacular, if a little moralistic, filmmaking, this still stands like a mighty obelisk, way out in front.